HentaiStream.com links or embeds content that was uploaded to popular Online Video hosting sites like Veoh.com / Megavideo.com / Youtube.com / Google Video. 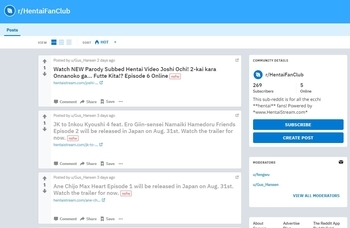 By clicking on any Links to videos while surfing on HentaiStream.com you watch content hosted on third parties and HentaiStream.com cant take the responsibility for any content hosted on other sites. HentaiStream.com indexes videos, similar to how Google does. All characters on HentaiStream.com are fictional and are 18 years or older of age. Any inquires or DMCA notices can be emailed to admin@hentaistream.com.